It’s Macrame week!! What does that mean? 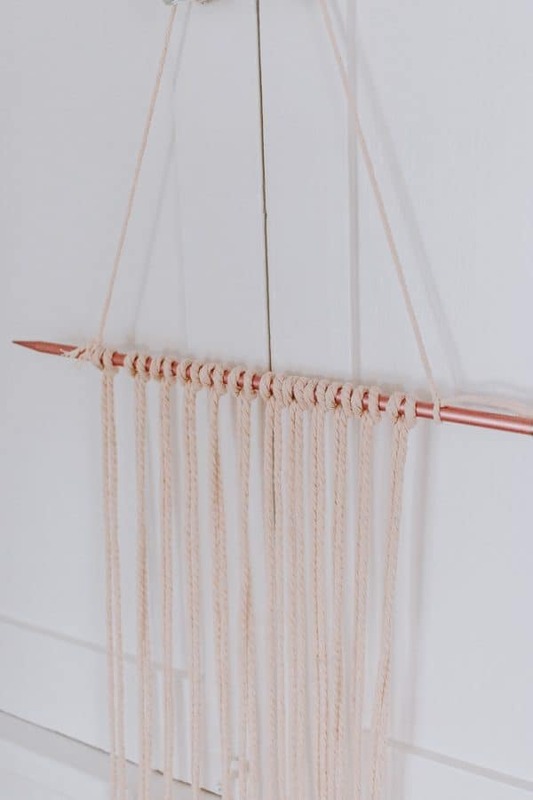 That means that for the next week, I’m going to be creating a series of easy DIY projects with Macrame. Follow along with me if you are into Macrame! 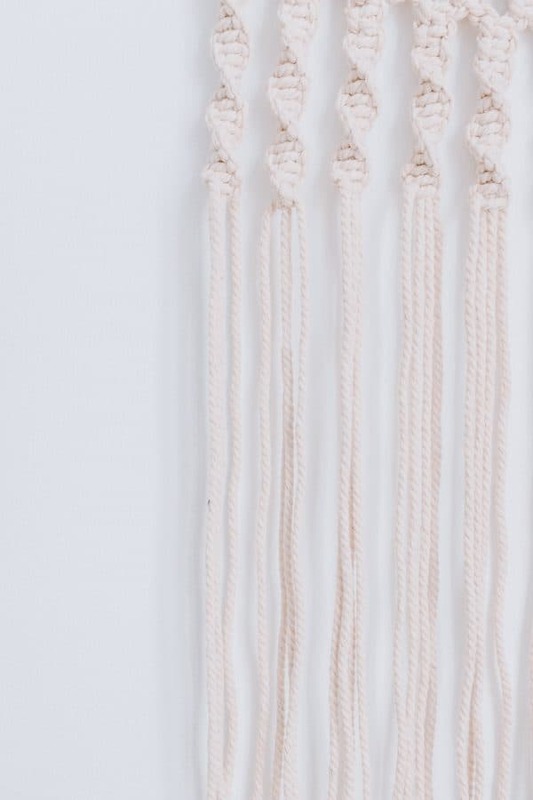 I’m starting off today with this simple modern DIY Macrame Wall Hanging. Here’s the funny thing about macrame. We may think that the larger pieces are super complicated to complete, but trust me, they’re not! 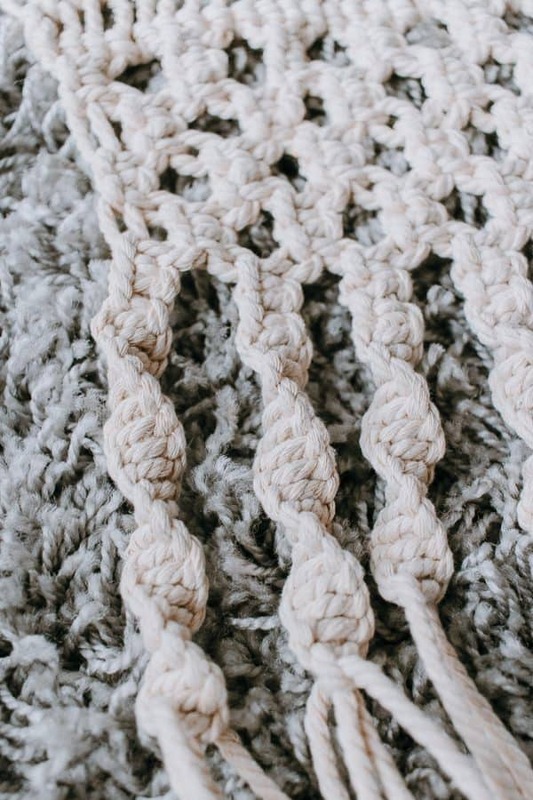 As you long as you keep the knots and overall design pretty simple it’s an easy project. 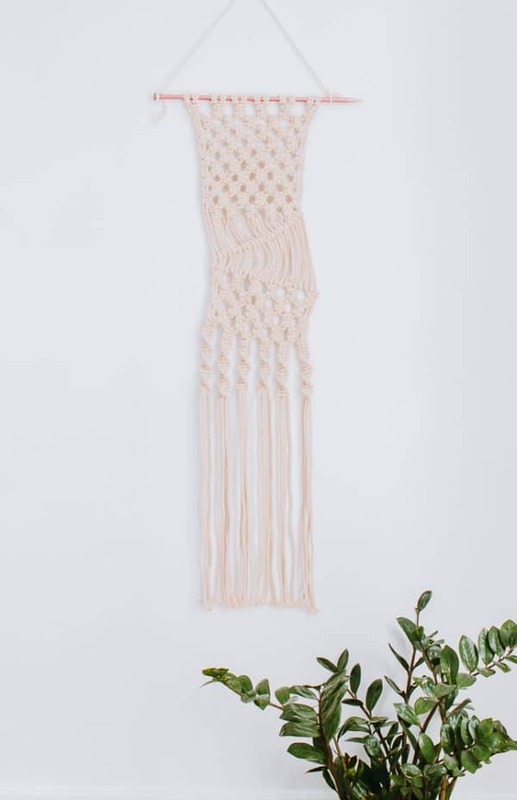 That’s exactly what this DIY macrame wall hanging is! That’s what makes this simple – I used a total of 3 basic macrame knots to complete it. What makes this modern? The shape! It’s extra long and skinny and this will fit in those random itty bitty wall areas where you need a bit of texture. Or hang this from a door. It’s a perfect size! 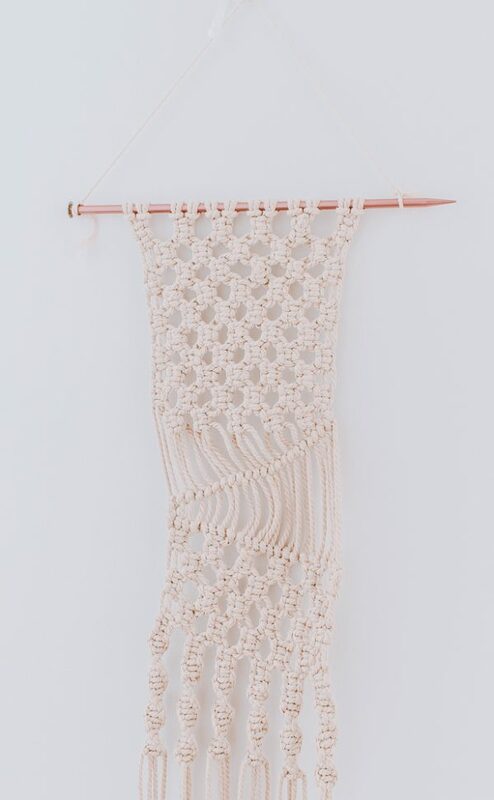 It’s a nice little nod to macrame for your decor. 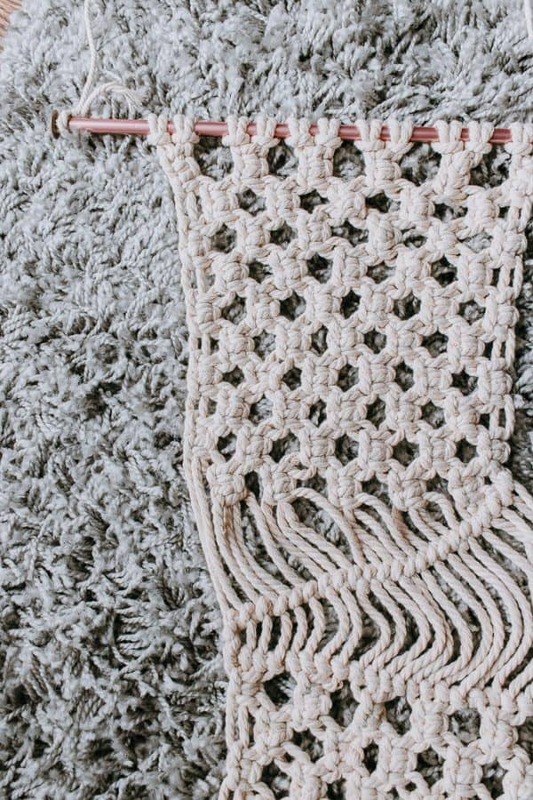 If you are new to Macrame – check out how to do these basic macrame knots. You can even print out a handy pdf included in that post to follow along. Macrame Rope – I used this 4mm rope – You will need (twelve) 12 – 16′ (as in feet) cords. Remember this is a longer wall hanging that’s why we need longer cords. You will also need 1 shorter piece of cording to serve as your hanger. Just tie it on there with a simple knot on either end. A dowel or stick – I used a long knitting needle (haha). As long as it’s straight and sturdy and the length you need- work with what you got! First thing you want to do is knot some cord around each end of your dowel. This will serve as the hanger for our project. 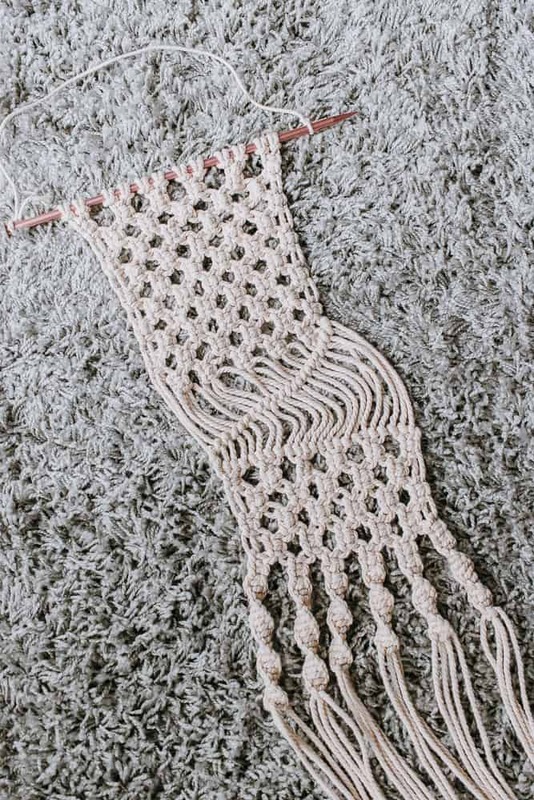 It’s much easier to make a macrame wall hanging when it’s hanging rather than laying down flat. You can hang this from cabinet knobs, doorknobs, a wreath hanger or even a picture hanger. Just make sure it’s sturdy! Start by folding your 16′ cords in half. Make sure the ends are even. Place the loop of the cord under your dowel and thread the ends of the rope through the loop. Pull tight. That’s your first Reverse Lark’s Head knot. (Refer to basic macrame knots for help). Repeat Step #3 with the remaining 11 cords. It should now look like the photo above. Make 2 rows of Square Knots first. (Refer to basic macrame knots for help). Now make 2 rows of Alternating Square Knots. Now make another 2 rows of Square knots. Continue to follow this pattern (2 rows of square knots, 2 rows of alternating square knots) until you have a total of 10 rows. Working from left to right – make double half hitch knots in a diagonal pattern across your piece. (Refer to basic macrame knots for help). Now, working from right to left – make double half hitch knots in a diagonal pattern across your piece. You should have worked your way back over to the left side! Continue the pattern of 2 rows of Square knots then 2 rows of Alternating Square Knots until you have a total of 4 rows. Make 2 more rows of square knots. We are going to finish the wall hanging with a set of spiral knots – which is basically just a series of half square knots (or left side square knots). (Don’t complete the right side of the square knot, just make left side square knots over and over again and it will spiral for you.) (Refer to basic macrame knots for help). I made a total of 13 half square knots to create this spiral. Finally – I trimmed the bottom cords into a straight line. Total dimensions for my wall hanging are 6.5″ wide by 34 ” long. Let me know how you guys did with this first project! 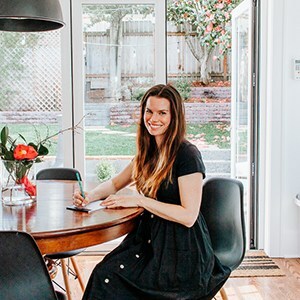 If you have questions – feel free to make a comment here. Stay tuned for more projects!